I love my crock pot. Seriously. I just don't understand people who don't use them! Every recipe I have come across is SO easy to throw together. Then you get home and dinner is ready. I mean really - what's not to love?! The convenience thing is a plus in my book, that's for sure. This is a "go-to" recipe for me. 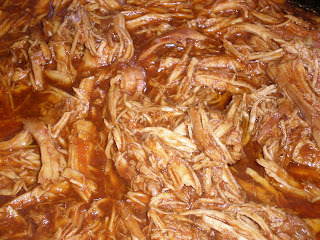 It's BBQ shredded chicken & nothing fancy...just BBQ chicken. But it tastes so darn good, and the chicken is so tender. Plus, you can use frozen chicken breasts which makes it even easier! We have enough for leftovers the next day (and it still tastes just as great! ), but I thought about using the leftovers in a creative way time: BBQ chicken pizza. Oh yeah, now I have to make this again very soon! Place frozen chicken breasts in a crock pot. Pour half a bottle of BBQ over the top. Add the hot wing sauce. Cook on low for 7-8 hours or on high for 4-5. Shred chicken with two forks about an hour before serving. Add additional BBQ sauce if you like it saucy! *I usually serve this with baked sweet potatoes and corn. Wonderful.